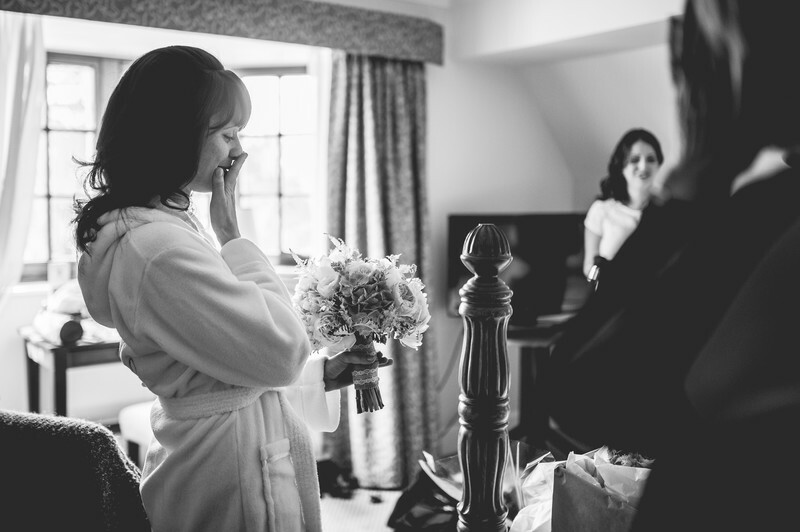 Cathy hired the bridal suite of the Wood Norton Hotel in Worcestershire for her bridal preparations. The wedding itself was held at Deer Park Hall in Eckington, on the border between Worcestershire and Gloucestershire. This image was taken at the very moment the bride picked up her wedding bouquet for the first time, and her reaction to them is priceless. On the right side of the frame you can see that the mother of the bride is reacting in a similar way. Documentary or reportage photography is the only way to capture moments of raw emotion like this. Unorchestrated and as authentic as it's possible to get, this is the way that the story of your wedding day should be told. As my wedding portfolio more than likely alludes to, I'm beginning to enjoy black and white wedding photography more and more. Removing the colour from an image serves to help people focus on the subject matter of the image, and what's going on in the photo. A careful conversion to black and white on an image that's worthy of it, seems to give the image a timeless quality. I always think that if I can continue to look at an image I've taken in years to come, and I still feel the same way about it then as I did on the day I took it, I've done what I set out to do.